Nuclear power, technology lock-in and safety issues, considered by the Boston Globe and an old Adam Curtis documentary. Bill and Ted’s Excellent Counterinsurgency: Rolling Stone tells the story of how a couple of twentysomething stoners became arms suppliers to the Pentagon’s war effort in Afghanistan. Changing attitudes to Wikipedia in universities. I’m always heartened when institutions stop trying to reject/ignore irreversible change, and start working out how to deal with it. Speaking of which … turns out filesharing isn’t killing off the music industry. I’m hopeful for more sensible policies from labels and industry bodies, but I’m not holding my breath. The Economics of Niche Programming at Overthinking It: why some cult shows thrive and some fail. 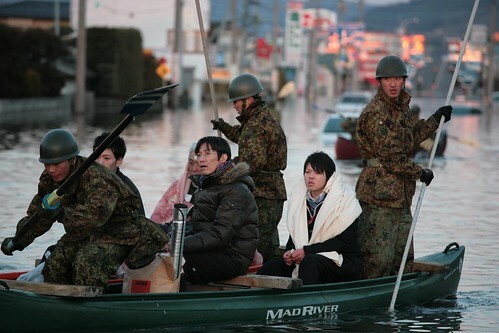 Doubtless you’ve all seen the images of devastation coming out of Japan over the past week or so. You can donate to relief efforts via Medecins San Frontiers or any of the organisations on this page. The idelogy of journalism vs. the culture of blogging (via Ben Goldacre). Stanley Kubrick, interviewed in 1987 by Rolling Stone. A critical look at microfinance schemes in Bangladesh. Events may have overtaken these pieces by the time I publish, but here are a couple of very good pieces on the Fukushima nuclear plant situation: how the plants are actually constructed, and safety measures have been deployed, and likely consequences, and a recent update on the situation. “The Most Famous Brain In The World” (via This Isn’t Happiness). The Vidoq Society: an association of police and forensic specialists who meet regularly to work on unsolved crimes. Jim Holt in the London Review of Books on Carr’s The Shallows and what the Internet is actually doing to our brains. Former head of MI6 Richard Dearlove surreptitiously filmed taking about Wikileaks and the Middle East. Vanity Fair on the Stuxnet virus and cyber-warfare. Ahead of the March 26th March For The Alternative, George Monbiot outlines what he thinks the alternative should be. And after all that heavy stuff, some pop culture: The Comics Journal plays host to Amy Poodle holding forth on Grant Morrison’s comics masterpiece The Invisibles. Two themes this week: politics and writing. NY Review of Books on the “volcano of rage” in Egypt. Foreign Policy on CANVAS, a group of Serbian students whose tactics helped topple Milosevic and who are now attempting to export non-violent revolution around the world. See also: BBC News on Gene Sharp, whose writings on nonviolent protest have influenced CANVAS and the Egypt demonstrators. Procrastion, time management and writing. In similar vein, Chris Hardwick of Nerdist looks at three self-help books to do with time management and working effectively. Sam Bain (one of the writers of Peep Show) on Notiquette: the art of giving and receiving notes on scripts. A short story by David Foster Wallace, and a long New Yorker piece on his life and work, struggles with depression and eventual suicide.